For anyone who ventures into the great outdoors has to love the month of October. 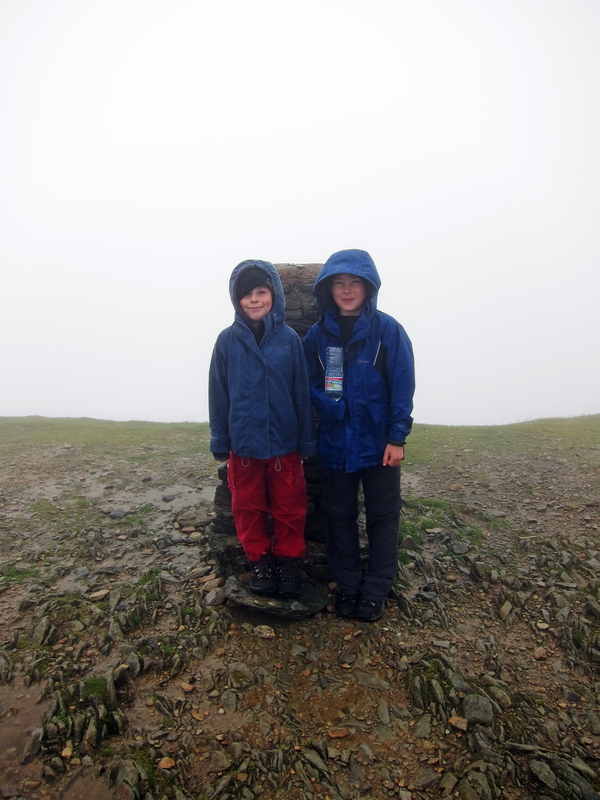 How can it be that this month can deal the 3rd hottest day of the year on our last walk onto Latrigg where it topped 28° then 28 days later blown over in 11° on High Rigg just a few miles away. October will be known forevermore as the box of chocolates month. Today the SMASH crew were down on their numbers as well as their luck for fine weather. The dreaded man flu was attacking the female variety too, Of course all who made it out last time were going to be missed on this outing, another lone peak squashed between the fell of Clough and the town of Keswick. As we approach Legburthwaite our starting location we are dwarfed by the range of the Dodds leading eventually to the Helvellyn massive, a mighty wall of scree and bare rock spotted with some very hardy looking sheep. We geared up for a not too wet day, the shelter of the car park low down is a poor indication of what lie ahead. 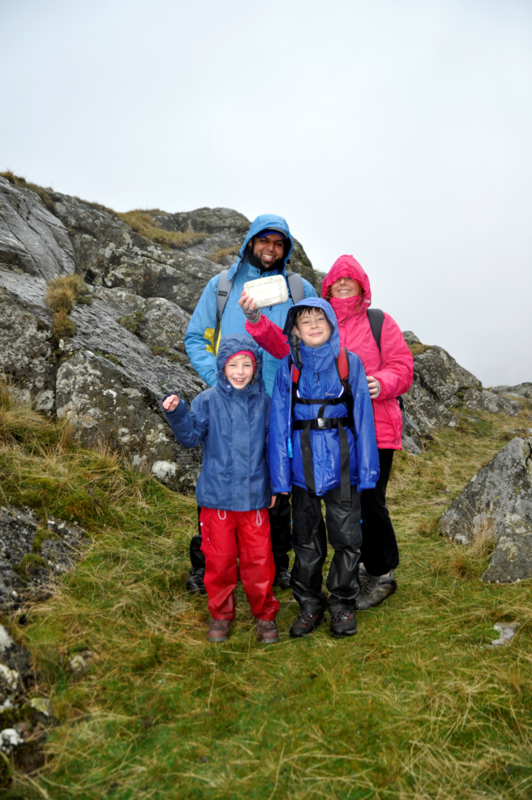 The small people (Jack and Emily) joined Angela, Abs and Dean to ascend 357meters at High Rigg or given it’s alternative Birkett name Naddle Fell via Wren Crag. The climb starts steep within 5 minutes and already we feel a cold breeze on our backs. Emily starts out leading an obvious narrow path through the mature oaks and Scott’s Pine trees upwards to Wren Crag. Turning back we can see Thirlmere Lake and the A591 running through the valley. 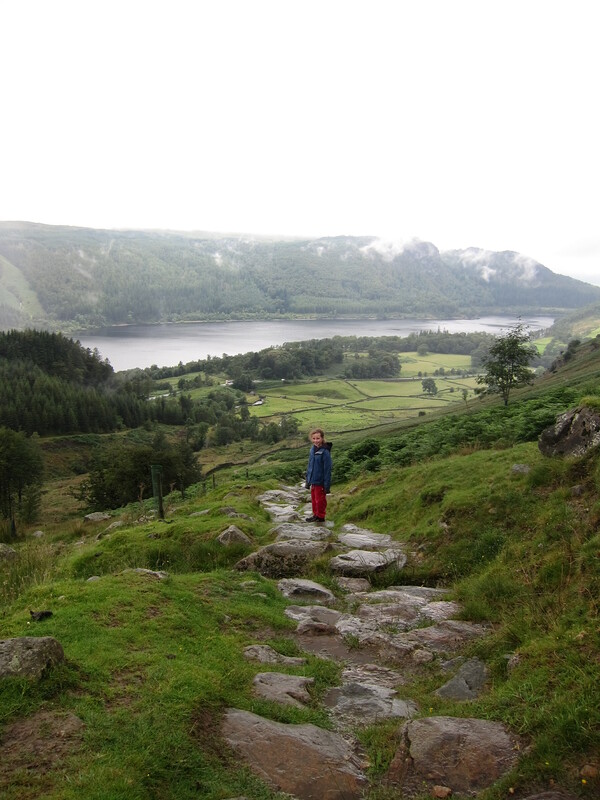 Thirlmere was once two lakes, Leathes Water and Wythburn Water before they were flooded and dammed to meet the increasing demand for water in Manchester. 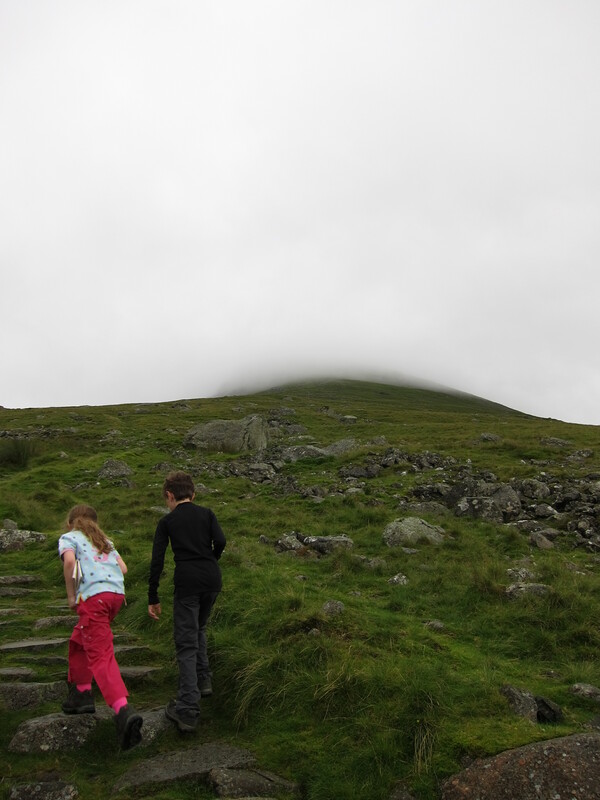 The path peaked and troughed and snaked along the ridge forcing a few ‘hands on the rock’ moments and the occasional bog jumping or stepping stone antics. You choose carefully or risk a booty. Abs and I broke out the wet trouser-ware. We knew they’d come in and glad we brought them. Jack traded the lead with Emily while Angela just stomped on with a tight hood and kindly lent Emily her woolly hat. That fine rain was actually just low cloud blown by a stiff wind to make it feel like rain. At least it was behind us. The extremities were beginning to feel the pinch of the wind chill, I wish I brought gloves. High Rigg soon loomed, displaying a boulder garden before it. A quick bound up to meet a stumpy cairn surrounded by puddles and an even spikier wind that made it almost painful to take in a full 360° view from the top. Angela wrapped tight couldn’t hear my gesture of “well done.” We made good time helped along by a south westerly that blew Abs off the summit to a quieter spot were he accidentally located the Geocache Jack and Emily we were searching for under a stone slab. SMASH took their name in the soggy log book. We set off for the return leg steeply down aiming for the youth centre. 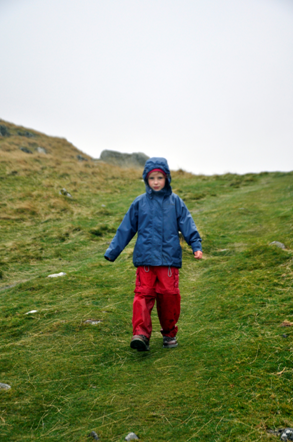 A sudden slip from Jack on wet grass spawned a new sport we proudly call Grarse Sliding. Amateurs now, but think of the future possibilities when one can steer their well trained buttocks to descend all Wainwrights. 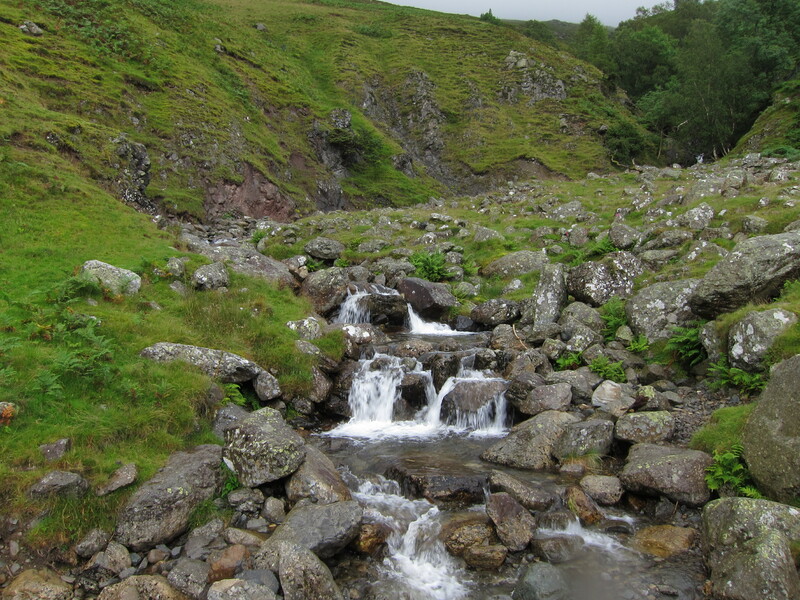 Is High Rigg No.210 the first of many? Almost certainly. We picked up the bridleway skirting around the base of High Rigg and happened upon the Tea Shop which was not unlike a house with Tea in. 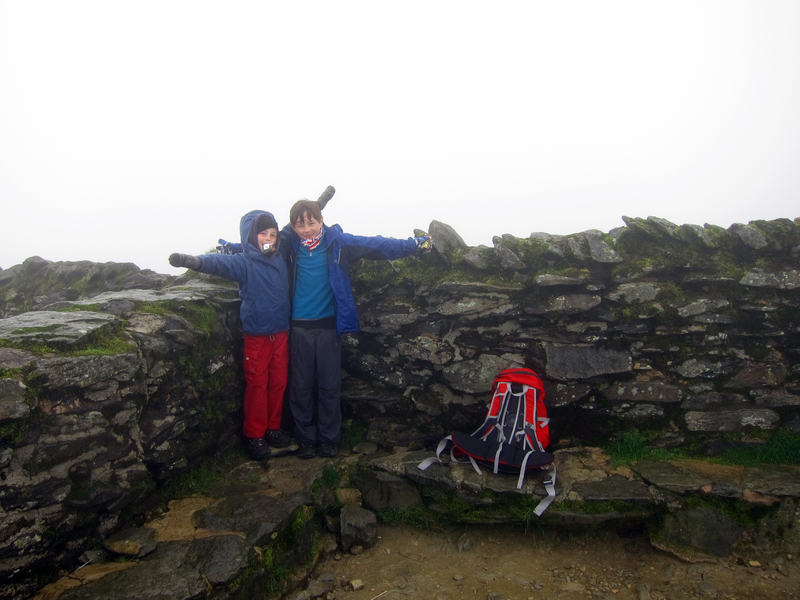 We helped ourselves to coffee and hot chocolate, dropped some change into the honesty box and left the lean-to conservatory to head back to the car for dry clothes and a warm, quiet journey home after an honest and spirited walk.